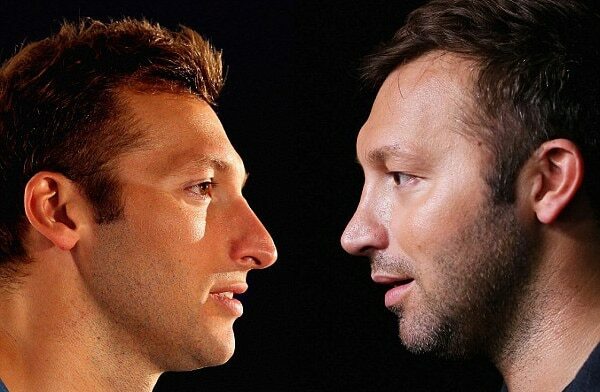 As one of Australia’s most recognizable Olympians, Ian Thorpe turned heads when he seemed to debut a new nose last week. While the 36-year-old has yet to comment on his ‘new’ look, celebrity plastic surgeon Dr Randal Haworth believes it’s clear that the star has gone under the knife. ‘Usually, this is associated with some breathing obstruction in his nose and is more often than not caused by a rhinoplasty performed through a ‘closed’ technique,’ he said, adding: ‘This is where a plastic surgeon performs the nose job solely through incisions confined to the inside the nose.’ Dr Haworth went on to reveal that an ‘open’ technique allows the surgeon better visualization and direction over both the shape of the nose and its use of breathing. A leading plastic surgeon assumes that Aisha Jade may have undergone a breast enlargement while chasing her Hollywood dreams. Aisha regularly shares bikini-clad photos of herself with her 342,000 Instagram followers but does to appear to have addressed her changing physique. Earlier this year, a leading Beverly Hills plastic surgeon declared that Iggy Azalea may have made changes to her facial shape by undergoing a ‘chin augmentation’ among other procedures. 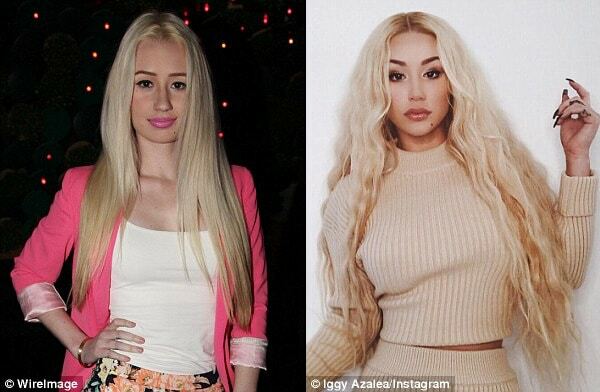 In June, Dr. Randal Haworth, the CEO of DrHaworth.com, told Daily Mail Australia that he believes the rapper could have made further changes to her facial shape. According to Dr. Haworth, who has not treated Iggy himself, the Australian musician appears to have invested in some ‘subtle’ and ‘beautiful’ refinements. ‘Iggy is what I would describe as an excellent “canvas” on which a plastic surgeon can reveal his work,’ he claimed. ‘When done right, results can be sublime and indiscernible to a layman’s eye. In the absence of rare complications, less surgical work is needed to create the beautiful, yet subtle, results as exemplified by Ms Azalea – while a less-than-average surgeon could draw unwanted attention to an anatomical “flaw” which only makes things worse.’ said Dr Haworth. In addition to Iggy’s rhinoplasty, which ‘straightened and narrowed her nose’, Dr. Haworth believes she may have undergone ‘a chin augmentation as well as mandibular angle enhancement to give her a more refined, “modelesque” jawline’. Kyly Clarke’s unexpected physical change has generated a lot of speculation over the past few years. A leading plastic surgeon has declared the 37-year-old’s changing looks over the years could be the result of a subtle mixture of DIY ‘tricks’. ‘It is amazing what a different hairstyle, well-contoured makeup and perhaps some “photoshopping” can do to make anyone look like a superstar,’ Dr Randal Haworth told Daily Mail Australia on Tuesday. Despite the fact she’s nearing her forties, Dr Haworth recognized how Kyly has undergone a ‘startling transformation’ in recent years. Dr Haworth noted that while makeup can certainly help change the appearance of facial features, he assumed Kyly’s ‘higher hairline gives a subtle clue’ that she is taking advantage of a simple ‘DIY’ beauty hack. 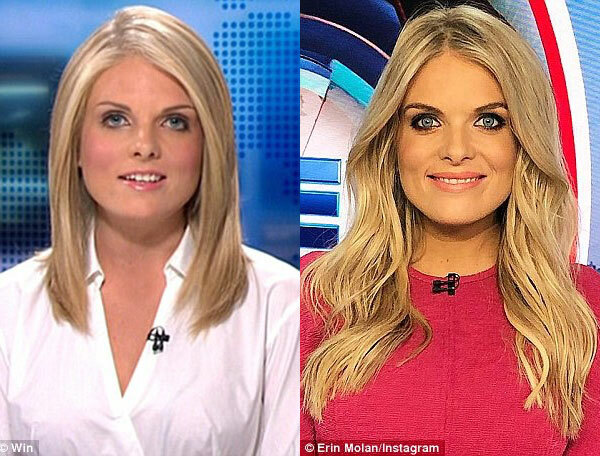 Erin Molan has stated her nose is 100% natural after claims she ‘invested in under the radar’ cosmetic work. Dr Randal Haworth claimed she has possibly undergone a breast augmentation, non-surgical fillers and a potentially ‘subtle’ rhinoplasty. 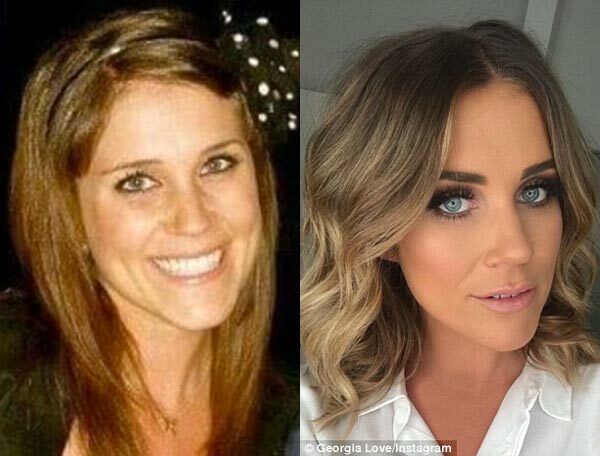 Further more, Dr Haworth stated the supposed surgical conclusion was ‘in proportion to the rest of her body… thus avoiding a potentially jarring transformation’. The small town country girl and former grid girl has made a slow and steady rise over the past eight years to become one of Melbourne’s top WAGs. A leading plastic surgeon claims Jessie has ‘stayed ahead of the game’ by enhancing her features with cosmetic procedures. Dr. Randal Haworth told Daily Mail Australia he believes Jessie has undergone a breast augmentation, as well using Botox and fillers. ‘I am quite confident she has neither changed her nose nor augmented her cheeks or jawline. However, her face does seem more elegantly defined perhaps with the help of a little makeup alongside a loss of ‘baby fat’,’ stated the Beverly Hills surgeon. Dr. Haworth also recognized that Jessie’s eyebrows appeared subtly higher over the years, and her lips, fuller. ‘Her eyebrows in certain photographs appear elevated into a more graceful arch which, at her age was most likely attained with Botox,’ he declared. The celebrity surgeon also described: ‘A hyaluronic acid filler such as Juvéderm or Restylane was the most likely culprit behind her present pleasingly plump lips. What is more obvious is her augmented bosom. Certain dresses reveal unnaturally round breasts with clearly defined edges. To me, that spells breast augmentation until proven otherwise. Despite this, I feel the size of her breasts do complement the rest of her body,’ Dr. Haworth stated. 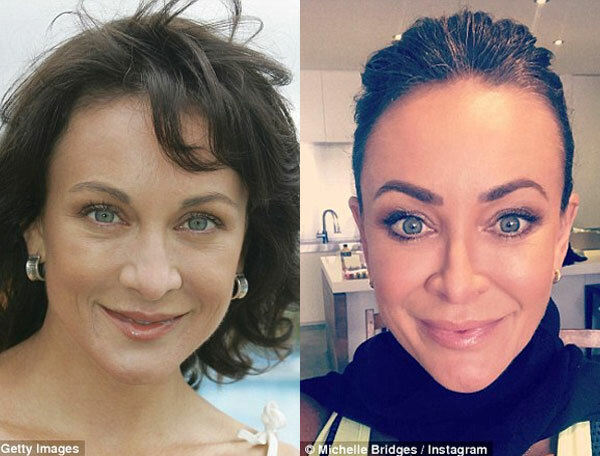 The Biggest Loser star Michelle Bridges has helped thousands of people with her fitness program. According to Beverly Hills-based plastic surgeon Dr. Randal Haworth, she may have undergone her own transformation. ‘It appears Michelle’s striking facial change came from an enthusiastic use of fillers and Botox. Unfortunately, the manner in which they were used tends to detract from her natural facial harmony rather than enhance it.’ said Dr. Haworth. Dr. Haworth went on to describe the tell-tale signs of Michelle’s supposed cosmetic work. ‘Her eyebrows are a tad too elevated into a pointed arch similar to Captain Spock, which is most likely the result of Botox. Ironically, this shape can be softened with a further small shot of Botox above each arch. I have a small suspicion Botox was also injected in and around her chin because her smile in recent pictures seems somewhat restricted and stiff,’ he explained. Dr. Haworth also described how Michelle appears to have used a filler such as Juvéderm to plump her lips and under-eye hollows. The Ten Eyewitness News reporter and former Bachelorette, Georgia Love, is known for her striking features and glamorous style. But Beverly Hills plastic surgeon Dr. Randal Haworth has claimed that Georgia Love, who once said self-confidence is the key to true beauty, may have had a helping hand with cosmetic treatments. ‘I feel she may have had a rhinoplasty because her nasal tip is more refined and her nasal bones narrower,’ he claimed. They’re known for their natural beauty, but it’s no secret Bachelor contestants have turned to cosmetic surgeons in the past. It has been revealed that several women from the Bachelor Australia have invested in some ‘nip and tuck’ before the show. Beverly Hills plastic surgeon Dr. Randal Haworth provided his thoughts on one of these contestants, Blair Thomas. Dr. Randal Haworth claimed it was quite obvious PE teacher Blair Thomas had undergone breast augmentation. ‘There is no disputing that Blair had her breasts enhanced, most likely with the help of a plastic surgeon. Her results make quite the statement and leave little to the imagination,’ Dr. Haworth observed. ‘The abrupt edge of her breasts as they transition from her chest wall indicate to me she had breast implants likely placed over her pectoralis major muscle,’ Dr. Haworth claimed. The Block winner Elyse Knowles has long been known for her stunning figure. Rumors have been circulating that she has surgically enhanced her physique, with whispers she has previously gone under the knife to increase her bust size. Beverly Hills plastic surgeon Dr. Haworth offered his thoughts on Elyse’s appearance. He explained there are several types of surgical breast implants, including ‘spotlight’, ‘rejuvenation’ and ‘balance’. Haworth is under the impression Elyse has undergone the latter procedure.